Have you ever been in Firefox and wanted to paste multiple lines of text into a single-line text field? You know, like in the example above where there is an address which has been placed on two different lines, but if you paste that into the Google Maps search field it will cutoff anything on the second line. In the Firefox Address Bar type about:config and press Enter. 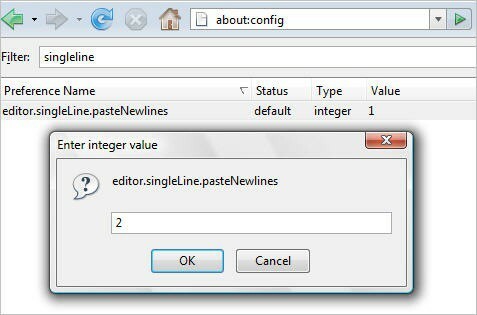 Find the option that is named editor.singleLine.pasteNewlines and double-click on it. Change the value to 2. Now you can copy and paste, or drag and drop multiple lines of text into a single-line input field! How cool is that?